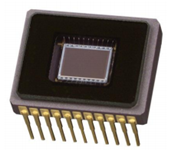 The KAI-0340 image sensor is a 640 (H) x 480 (V) resolution, 1/3” optical format, progressive scan interline CCD. This image sensor is offered in 2 versions: the KAI-0340-Dual supports 210 full resolution frame-per-second readout while the KAI-0340-Single supports 110 frame-per-second readout. Frame rates as high as 2,000 Hz (KAI-0340-Single) and 3,400 Hz (KAI-0340-Dual) can be achieved by combining the Fast Horizontal Line Dump with custom clocking modes. Designed for demanding imaging applications, the KAI-0340 provides electronic shuttering, peak QE (quantum efficiency) of 55%, extremely low noise and low dark current. These features give this sensor exceptional sensitivity and make it ideal for machine vision, scientific, surveillance, and other computer input applications.